Seizures in hamsters are not as apparent as in people or dogs. When observed, they should be considered a medical emergency, especially in Russian or Campbell's dwarf hamsters, which are prone to diabetes. There are many causes for hamster convulsions, including diabetes, brain injury, brain defects, poisoning, stroke or inner ear infections. The inner ear helps control the hamster's balance. Hamster seizures can be as mild as walking around with a head tilt or walking around in small circles. A hamster that is having trouble walking, collapses or falls on its back may be experiencing a seizure. Dwarf hamsters have more brain defects than the usual Syrian or golden hamster, according to veterinarian and microbiologist Elizabeth Newberry. Hamsters that fall on their backs or run about in small circles tend to have brain defects, which are incurable. Hamsters that suddenly fall on their backs, hiss and show their teeth are not having seizures. They are merely startled. This is a defensive posture among hamsters. Treatment depends on the cause of the hamster's seizures. Diabetic hamsters are treated with diet. Ear infections are cleared up with antibiotics. 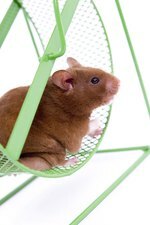 Hamsters with strokes can recover if kept warm and quiet.